Socially Awkward Penguin is part of a plethora of penguin parodies that include Socially Terrifying Penguin and Socially Fed Up Penguin. Socially awkward Penguin has a little bit of difficulty determining how both people and penguins are supposed to behave in certain social situations. This flightless waterfowl often comes across as clunky, confused, and just doesn’t quite get it. This adorable black and white creature is part of the Advice Dog series that spun off around the year 2006. He is the narrator who relates and recounts for us certain unsettling social moments and sayings. Penguins are a bit of a dichotomy, both distinguished and silly at the same time. With their tuxedoed appearance, they make all of those awkward moments we encounter seem all the more funny. 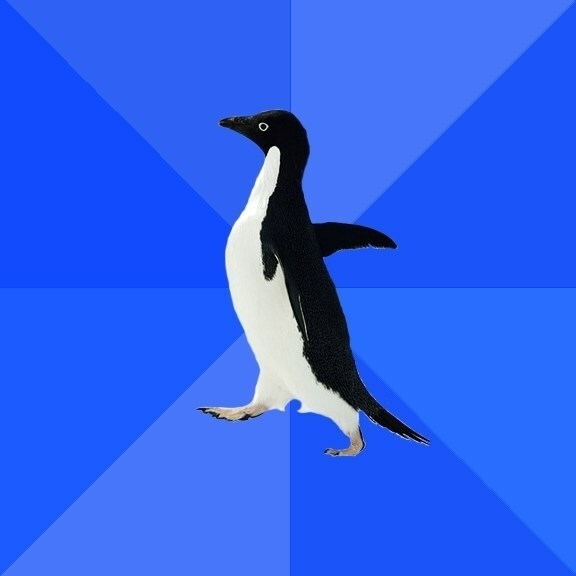 Moments such as “Stand alone … don’t know what to do with your hands” are the specialty for Socially Awkward penguin. All of those moments where you feel just a little bit weird and don’t know how to handle it are the milieu of this feathered, herring-eating bird. “Start dancing and feel weird … stop” is another of Socially Awkward Penguin’s witty sayings. Have an uncomfortable silence? This is the penguin for you. Order a beer while everyone else orders a soda? He’s your bird. Holding the door open for someone but they’re just a little too far away? Yep, he covers that, too. Any time you see a socially awkward saying with a picture of a penguin and a solid-colored background, chances are you are looking at wisdom from Socially Awkward Penguin.